This product caused a lot of discussions and interest before the release. Actually, not only the Ninebot ES2 but the rest of models such as the ES1 and ES4 were in the same situation. Actually, they differ by technical parameters only. Say, the ES1 is the most budget electric scooter of the series, while the ES4 comes with the highest features. In this sense, the ES2 can be considered as the golden mean. At this moment, our protagonist is offered for $429.99, which is a great offer if taking into account what ambitions it has and what features it comes with. The Ninebot ES2 electric scooter comes with 8-inch wheels and an electromotor with a power of 700W. Thus, it is very comfortable for a city ride. 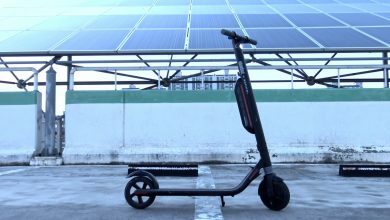 The scooter’s construction is made of an aviation aluminum alloy and rubber materials that provide 20 – 100 kg payload. This electric scooter is quite compact. It has a length of 1m, a width of 0.4m, and a height of 1.11m. The wheels are located from each other at a 0.8m distance. The platform width is 0.15m, while the length is 0.45m. Moreover, the total weight of 12.5 kg allows you to carry it with no efforts. Thanks to the easy one-push folding system, it can be folded in no time. You just have to press the single latch at the bottom of the steering column, pushing the steering wheel slightly forward. On top of the deck is covered with a silicone layer that provides excellent grip of the shoe sole and the surface of the board, eliminating slipping. The silicone layer is simple and easy to clean. Dirt is easily cleaned from the surface by a simple wet sponge or rag, unlike emery coating. 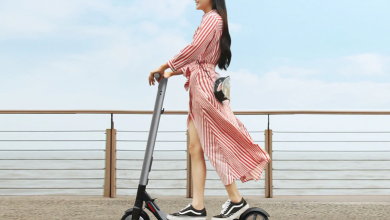 This electric scooter sports a built-in LG battery combining high-quality 20 batteries. They are combined in two assemblies, located in parallel. The capacity of each element is 2600mAh. So the total capacity us 5200mAh (187Wh). Plus, you can charge this scooter through an additional battery. An additional battery is attached to the steering column. This will increase the mileage in half. The steering wheel allows you to make turns more than 45 degrees both to the right and to the left. On the right side of the handle is a gas trigger. On the left, there is an electronic brake. The onboard computer with a bright display is placed in the middle. It displays data on the speed, the level of charge, the kilometers traveled, etc. Below of it, we can find a button, a short press on which starts the device. To turn off the electric scooter, you need to hold the button a little longer. There is also an option to control the Ninebot ES2 from the screen of your smartphone. The program displays the current status of the scooter and some useful parameters (speed, power, battery level, battery temperature). In the application, you can also block the movement of the ES2, change the settings, set the maximum speed in modes, adjust the launch of cruise control, update the firmware of the controller and monitor its temperature. It’s also worth to mention, on the steering rack, there is a bright headlight for movement in the dark. The headlight is LED, with a good lumen, as a reflector used TIR-optics. The stoplight also uses the LED and is located on the rear wing. There is a beautiful decorative backlight on the bottom of the deck. It gives not only a beautiful aesthetic appearance but also emphasizes your location.